Luella grew up and was educated in London. She studied at Hornsey & Byam Shaw Colleges Of Art with Post-graduate Studies at Goldsmiths College, London. After lecturing part-time in London and Sussex, Luella travelled extensively in Europe and lived in Australia for 12 years, seven of which were spent living on a steel ketch in Queensland. 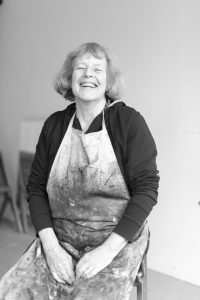 She returned to England in 1997 and is now working full-time in her studio at Phoenix Brighton on the south coast where she paints and prints her etchings. Studio visits are welcome – please complete the form which can be found on the contact page.